I love disaster/survival books, both fiction and non-fiction. Reading about how ordinary people manage to survive in impossible situations from plane crashes to blizzards to massive power outtages has always fascinated me. Each story makes me wonder if I'd be able to survive something similar, and how I would go about doing it. 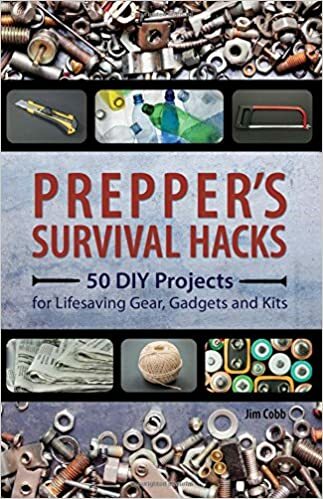 So when I saw Jim Cobb's book Prepper's Survival Hacks: 50 DIY Projects for Lifesaving Gear, Gadgets and Kits at the library, I couldn't resist checking it out. And it's awesome! Did you know a child's crayon can be used as a candle? Or that with a little Vaseline and some cotton balls you can make your own firestarters? Or did you know you can build a buddy burner out of some corrugated cardboard, melted wax and an empty tuna fish can? There are SO many cool DIY projects in this book; I want to try them all! I've been working on my own personal Bug Out Bag all week (which is just your basic 72-hour emergency kit packed in a backpack), and I think this weekend I might try turning an empty Altoids tin into a candle. Or maybe my own small survival kit. So if you're secretly a prepper at heart like me, give this little book a read. it can be downright addicting." :) I'm a fan of dystopian and survival books, too. My first one was Robinson Crusoe when I was a kid. My father gave me Robinson Crusoe and my brother got Black Beauty. At first, I was so frustrated--he should have know I wanted Black Beauty! But I fell in love with the ways and means of Crusoe's survival on the island and was hooked. There is a course offered in NC, I think, that gives people all kinds of survival techniques. Fascinating details for people who are accustomed to electricity and grocery stores! I've read One Second After and Alas, Babylon, but the other books you mention are new to me. Will check them out. Oh, and Ted Koppel's Lights Out is fascinating nonfiction. Known, not know. I should edit better. Sounds like some fun projects to try. I'm not much of a survival/camper/outdoorsy girl but I'm always fascinated to learn what can be used for what in case of an emergency. For some reasons I'm not much of an adventurous person, but I do love reading about survival theme books and the more if they are thrillers. :) This book sounds like both a fun and informative read. I love stuff like this too! Fantasizing about surviving is not an insignificant pastime of mine. And for the crayon candle, you don't need a wick...just break the tip off the top so the paper wrapper is a little higher than the wax and light a match. I did, and while it was a little tricky to get it to light at first, once I got the outside paper to light my little crayon produced a very nice flame. :) Crayon candles, who knew? I do know about DIY options for firestarting. I have a fire pit, and I never like to use any chemical firestarters. That's probably all that I do know when it comes to DIY survival stuff. I bet that's a neat book.